It was in Ottawa that we realized what we had in Jackie,” Letitia Baldrige said in a confiding tone, after I mentioned I was from Canada. “I remember the Canadian ambassador warning me,” she continued, “that Canadians were rather unemotional and that we shouldn’t expect much enthusiasm from them. Well, he couldn’t have been more wrong!” she concluded with a silvery chuckle. Tish Baldrige had been the Kennedy administration’s Social Secretary, a quaint title for the First Lady’s chief of staff. And it was she who had orchestrated the dazzling White House evenings that had earned the JFK era its “Camelot” sobriquet. In the fall of 1996, I was trying to persuade her to collaborate with Jackie’s French chef, René Verdon, on a book chronicling those memorable occasions. Tish soon consented and, in her introduction to In the Kennedy Style (1998), she describes receiving a phone call from Jacqueline Kennedy in July of 1960. “Can you believe that Jack made it?” Jackie asked excitedly, her voice rising like an exuberant schoolgirl’s above the background hubbub. “He really made it! Will you come to the White House to head up my staff? Tish was pleased to be asked. She had known Jackie since their boarding school days at the über-posh Miss Porter’s School in Farmington, Conn., where Jackie had kept her own horse. Tish had gone on to Vassar College where Jackie, three years her junior, later followed. After graduation, Tish snagged a prized job at the American embassy in Paris and, before long, Jackie arrived there to study at the Sorbonne. Later, while home on leave, Tish had lunch with Jackie in Washington where they reminisced about Paris, and Jackie told her that she was dating Congressman Jack Kennedy. Tish knew the Kennedy sisters and also knew of handsome Jack’s reputation as a ladies’ man. She hoped Jackie wouldn’t be let down. Tish had similar thoughts after Jackie’s call to her in the summer of 1960. The White House job offer didn’t seem real because at that point John F. Kennedy had only won the Democratic nomination, not the election. And a young Catholic being elected president of the United States in 1960 seemed “an impossibly long shot” to her. Yet JFK did manage to eke out a narrow win over Richard Nixon in November and so, on Inauguration Day, Jan. 20, 1961, while the young new president was proclaiming that “the torch has been passed to a new generation,” Tish was in a small procession of cars entering the White House gates. With her was everything from her office files to the presidential couple’s valet and maid carrying their finery for the evening’s inaugural balls. Tish remembered that even as a teenager, nothing ever looked wrong on Jackie Bouvier. She could buy a simple dress and add a belt or accessory and make it look stunning. Since her marriage, Jackie had preferred French designers, particularly Givenchy, but after some election sniping about her expensive French wardrobe, she had vowed to wear only American clothes. 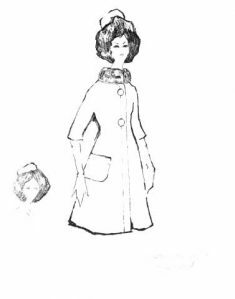 On May 15, 1961, a White House press release headed Mrs. Kennedy’s Wardrobe for Canadian State Visit described each of the seven Oleg Cassini-designed outfits she would be wearing in Ottawa. (Sketch on left. )It caused such a media frenzy that it was the last press release ever issued about the First Lady’s clothes, yet it indicates the importance accorded this first official trip outside the U.S. When Air Force One taxied to a stop in Ottawa on the afternoon of May 16, Jackie descended the stairs behind the president wearing a navy blue dress and matching coat with a small white hat perched at the back of her bouffant-styled hair. She had always detested hats and, now that she was required to wear them, had requested “easy-to-wear, back-of-head pillbox ones,” unwittingly igniting a major fashion trend. Waiting on the tarmac were Governor General Georges Vanier and Madame Vanier, and Prime Minister John Diefenbaker and his wife, Olive. During the official welcoming ceremony, Diefenbaker greeted the Kennedys with several sentences in his trademark mangled French. Before responding with a brief Jackie-coached French greeting of his own, JFK couldn’t resist needling Diefenbaker. “I am somewhat encouraged to say a few words in French,” he said with a wry smile, “having had a chance to listen to the prime minister.” The reporters chortled, while Diefenbaker – never a man who liked to be teased – flushed red. Kennedy then made matters worse by mispronouncing the PM’s name as Diefen-bawker. He had done this once before, when announcing their first meeting in the Oval Office on Feb. 20, 1961, and Diefenbaker had not taken it well. This time the old prairie pol suspected it was deliberate. The Vaniers, by contrast, were an immediate hit with the Kennedys – Jackie said she “adored” them and described Georges Vanier to historian Arthur Schlesinger as “the most marvellous-looking old man.” Pauline Vanier was “very motherly” on the trip from the airport, calling her “dear” and showing her how to wave. She also noted that the vice-regal couple was “flabbergasted” by the cheering crowds along the route, which far exceeded those for the Queen on a recent royal tour. Tish Baldrige remembered hearing rhythmic chants of “Jack-ie, Jack-ie” from the sidewalks, and Enthusiasm Astounds Ottawa topped the next day’s headlines. The Kennedys were elated when they arrived at Rideau Hall, and soon they were ushered into the gardens for a tree-planting ceremony. This had been a tradition for visiting dignitaries since 1906, and JFK and Jackie were each to plant a red oak on either side of a stone path. As he shovelled earth onto his tree with a silver-handled shovel, however, Kennedy suddenly grimaced in pain. The action had inflamed his bad back, injured during a college football game and again after the sinking of his torpedo boat PT-109 in 1943. 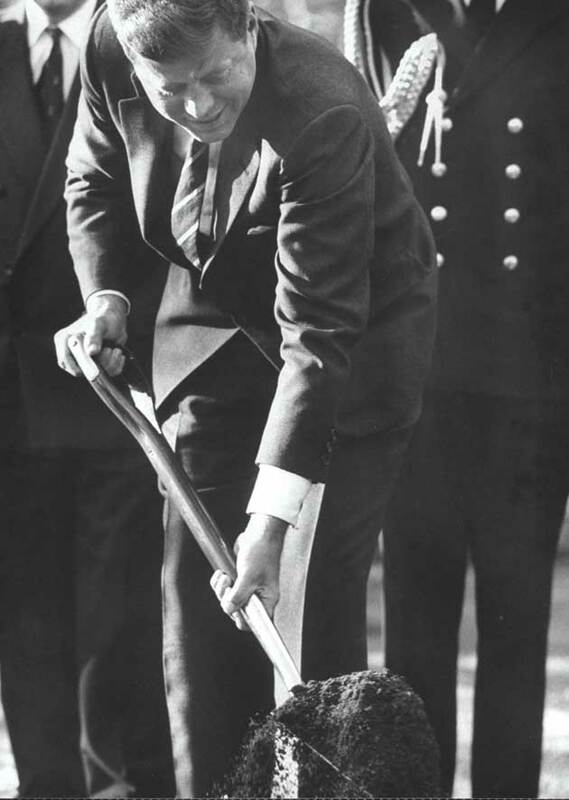 “I wonder if this is symbolic,” he said with a game grin as handed the shovel over to Diefenbaker. He would be in agony for months, and each spasm would remind him of John Diefenbaker. Back inside the residence’s royal suite, JFK downed a daiquiri and began dressing gingerly for the evening’s white-tie dinner, while Jackie put on the sleeveless white-silk evening gown that Cassini had designed for the occasion. Downstairs, the cream of the capital’s elite were gathering in the Tent Room and, in the receiving line before dinner, Jackie was charmed by all the women curtsying to the Vaniers (a practice discontinued in 1967). As they dined on pheasant consommé, Arctic char and spring lamb, some of the 110 guests at the horseshoe-shaped table noted how animatedly Jackie chatted in French with Georges Vanier, while her exchanges with John Diefenbaker, seated to her left, seemed more perfunctory. JFK was spared dinner chat with the prime minister since protocol had placed him next to Madame Vanier three seats away. After dinner, there was a reception for another 500 guests from which Jackie begged off, leaving her husband to grip and grin till midnight despite his throbbing back. Before nine the next morning, the president arrived at the U.S. Embassy to confer with American ambassador Livingston Merchant in preparation for his meeting with Diefenbaker. The two leaders met first for a wreath-laying at the National War Memorial near Parliament Hill and then walked together in the spring sunshine toward the PM’s office in the East Block. Diefenbaker’s secretary, Bunny Pound, recalled for Knowlton Nash’s book Kennedy and Diefenbaker (1990), how “all the secretaries lined the walls, clapping their hearts out for Kennedy” though she sensed her boss was a little envious of their enthusiasm. With Cold War tensions running high, another issue of keen importance to the Americans was the installation of U.S. nuclear warheads in Canada. Defence Minister Douglas Harkness had urged the PM to strike a deal on this with JFK, but Diefenbaker again stalled, saying public opinion was running against it. When the meeting ended after two-and-a-half hours, Kennedy was visibly disappointed that Diefenbaker had either waffled or been negative on the things that mattered most to him. Jackie, meanwhile, had spent the morning in the company of Olive Diefenbaker, touring the National Gallery and then visiting the RCMP barracks for an abbreviated version of the Musical Ride. Cassini had designed a yellow wool suit for her to wear that morning, but instead she had put on a red Pierre Cardin day suit of her own. When the huge finned limo pulled up at Mountie headquarters, it became clear why. As she greeted RCMP Commissioner Clifford Harvison, the sight of her red outfit against his crimson tunic sent the photographers into overdrive. 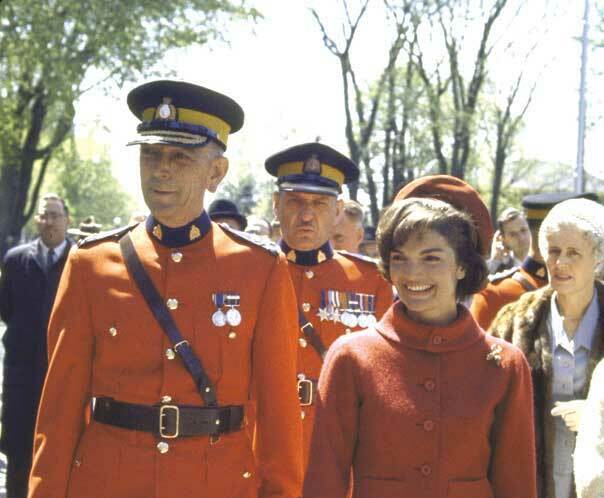 Pictures of her with the red-coated Mounties would become the most famous ones of the visit, appearing on the cover of Life and other magazines. In some of the photographs, Olive Diefenbaker can be seen standing in the background with a strained smile on her face. It’s hard to imagine two more different political wives than Olive and Jackie: one the ultra-loyal, matronly Baptist minister’s daughter from Saskatchewan who prized her hats; the other, the glamorous young product of Park Avenue and Newport with her couture wardrobe and Sorbonne-accented French. “Olive didn’t like Jackie,” Bunny Pound confided to Knowlton Nash. “She thought she was snippy.” Jackie, by contrast, told Arthur Schlesinger: “Mrs. Diefenbaker is such a nice woman.” During the lunch the Diefenbakers hosted for the Kennedys at 24 Sussex Drive, Jackie was effusive in her praise of the PM’s residence with its sweeping views of the river. Yet it was an awkward occasion, since, as Jackie related, Diefenbaker insisted on “telling all these Churchill stories in accent and calling him ‘old Winston’ or ‘the old boy’ or something. It was just painful.” Diefenbaker had enjoyed swapping Churchill anecdotes with Eisenhower, with whom he had an “Ike and John” cordiality, and he may have reverted to them to mask his discomfort with Ike’s successor. Before the luncheon, Jackie had changed into a beige ribbed silk ottoman dress with matching coat and pillbox hat, which she would also wear that afternoon in the gallery of the Senate for her husband’s address to Parliament. Senate Speaker Mark Drouin welcomed her by noting that “she is, like us, of French descent” and “has conquered all our hearts.” Her husband’s speech is best remembered for its assertion: “Geography has made us neighbours. History has made us friends.” The address was greeted with a thunderous ovation though Diefenbaker seethed inwardly that Kennedy had again made a plea for Canada to join the OAS. At a small, private dinner that evening for the Canadian leadership at the U.S. ambassador’s residence, JFK earned a further black mark by clearly enjoying the company of Diefenbaker’s nemesis, Liberal leader Lester Pearson. Kennedy liked Pearson personally and admired his work at the UN solving the Suez crisis, which had won him the Nobel Peace Prize in 1957. After dinner, the ruffles on Jackie’s pink silk evening gown swirled about her ankles as the ladies withdrew (another outdated custom), and the men lit up their Cuban cigars. Through the haze of smoke, Kennedy continued to focus on “Mike” Pearson, largely ignoring Diefenbaker, and the PM left the dinner early. On April 29, 1962, an elegant dinner was held at the White House for winners of the Nobel Prize. It would become perhaps the most storied evening of the Kennedy era but it sent John Diefenbaker into a funk. Tish Baldrige told me that JFK had asked that Lester Pearson be invited, and since he was the only non-American on the guest list, she had quickly added two European Nobel laureates living in the U.S. for cover. Pearson met privately with the president before the dinner, which convinced Diefenbaker that the Americans wanted the Liberal leader to win the election that had just been called for June 18. Not long after the Nobel dinner, the departing American ambassador, Livingston Merchant, decided to pay a farewell call to the prime minister at Sussex Drive. Once inside his study, Diefenbaker erupted about Kennedy trying to install Pearson as prime minister. Quivering with rage, he then threatened to make public the memo that JFK had left in his office the year before, which to him demonstrated how the U.S. wanted to push Canada around. When word of this threat reached the Oval Office, Kennedy exploded, calling Diefenbaker a blackmailer and turning the air blue with expletives. He swore that he would never meet with Diefenbaker again. When Merchant conveyed this to Diefenbaker, the PM put the paper back in the vault. The Conservatives won the June ’62 election, though they were reduced to a minority government. Relations with the U.S. continued to be frosty, and nuclear warheads in Canada remained a thorny unresolved issue. When the NATO Supreme Commander, General Lauris Norstad, visited Ottawa on Jan. 3, 1963, he stated at a news conference that if Canada did not accept nuclear weapons, it would be failing in its NATO commitments. Diefenbaker did calm down and returned to the House the next day to fight a non-confidence motion, which he lost, and his government fell. The Liberals felt sure they would sweep to a majority in the April 8 election, but the old warrior mounted a fiery personal campaign, boasting, “It’s me against the Americans, fighting for the little guy.” The Liberals came in five seats short of a majority but were able to govern with the support of the NDP. The Kennedy administration breathed a sigh of relief that Mike Pearson was now the Canadian leader and on May 10, the new PM flew down to Hyannis Port for a cordial meeting with JFK. This article first appeared in pages of the Nov.2013 Zoomer issue. On newsstands now!